Welcome to the Puppy Tales Christmas Gift Guides for your dogs! Most of us don’t need an excuse to spoil our pups! But Christmas does give us a little extra incentive and the occasion to have them join in all the fun of celebrating festivities, parties and, of course, presents! With our gift guides we wanted to share with you our favourites – all things we love ourselves for Keiko, Summer & Rosie! There’s inspiration and ideas for all dogs and all budgets. We’ve got things for the foodie pooches, for the hounds who love human-dog adventures together, the pups who quite like the finer lux things in life, the most fun (fun, fun!) for all dogs and for the people who love their dogs like crazy. 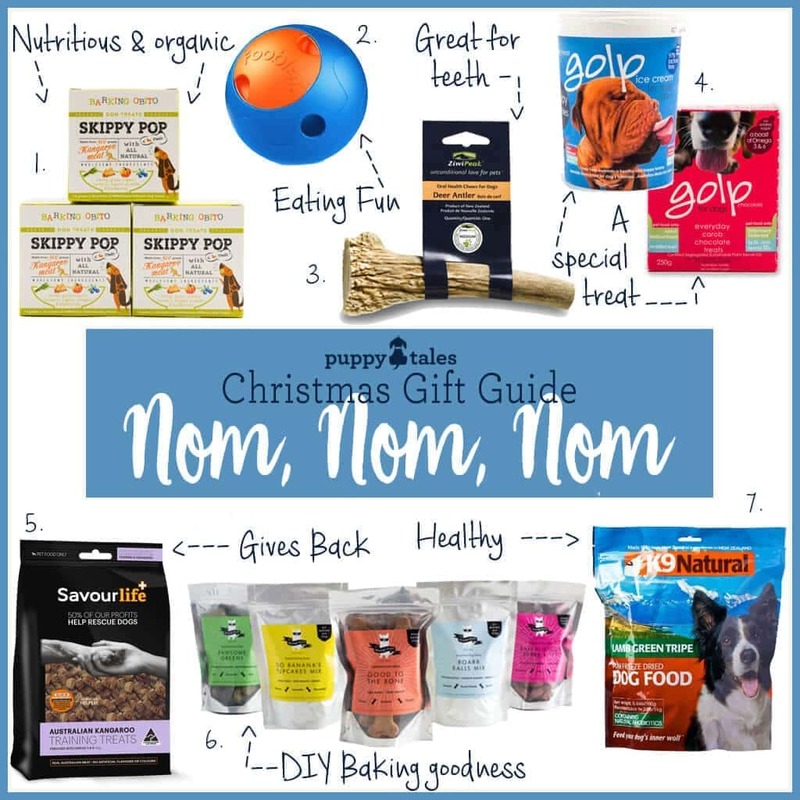 Let’s start with our ‘Nom Nom Nom’ Gift Guide – perfect for the foodie pooches, but really there’s something here for all dogs. For a long time we have been making a summer ice cube treats for Keiko and Summer using stock and wishing for something that contained things that were only all good for them. Then came Skippy Pop – the organic and wholesome ingredients were exactly what we wanted! And since we’ve had this in the cupboard we’ve found it comes in handy on occasions – we add it to water when we want to encourage the dogs to drink a little more on hot days and ensure they are well hydrated. It’s also great when Keiko gets an upset tummy – helps relieve the inflammation and give him hydration and nutrients quickly. Is your dog a super quick eater? Perhaps you’d love a way to make mealtimes more mentally stimulating for them? The Foobler is a great alternative to popping biccies in a bowl or as an interactive, fun way to dispense treats throughout a day. To use, you simply fill the chambers of the Foobler with biccies or treats, configure the timer and then pop it down. At the intervals you’ve set it will chime and as your dog rolls it around the treats from one of the chambers will be released. Summer is a super quick eater so we used the Foobler daily when she was a puppy to dispense small meals throughout the day and for slowing down how quickly she ate them. While we don’t use it every day now, we still pull it out on wet days as it provides her entertainment and mental stimulation and that helps keep her (and us!) sane when we can’t get out for our daily walk. Do you have a dog that loves to chew? Antlers are a great option – they’re great for teeth and gums, last a really long time compared to other options, they’re odorless (even after being chewed on or left in the backyard), the won’t splinter and are full of nutrients to help aid healthy digestion. We especially love the Kiwi Peak Antlers – they are cruelty free being naturally shed from deers in grass pastures of New Zealand. *Some vets won’t recommend hard chew options like antlers for dogs as they may cause or contribute to broken teeth. We’ve not experienced this but would recommend you chat with your vet about the suitability for your dog’s age, size and breed if you’re concerned and purchase appropriate size and density of antler for your dog. Golp make chocolate and ice cream for dogs! Yep, you read that right! And judging from Keiko, Summer and Rosie’s response when we bought them home for them them to try out recently, they thought it was a fabulous doggie invention. The ice cream is green tea infused so has antioxidant properties and comes as single serve 6 pack cones and tubs. The single serve we thought the most wonderfully fun to give the dogs as they are proper little ice cream cones! The chocolate is made from carob, contains Omega 3’s and 6’s which may help maintaining a dogs skin and coat and comes in either in a single or bulk pack. * The ingredients for the ice cream has sugar listed so for us these are treats that we would give on very special occasions (not daily). 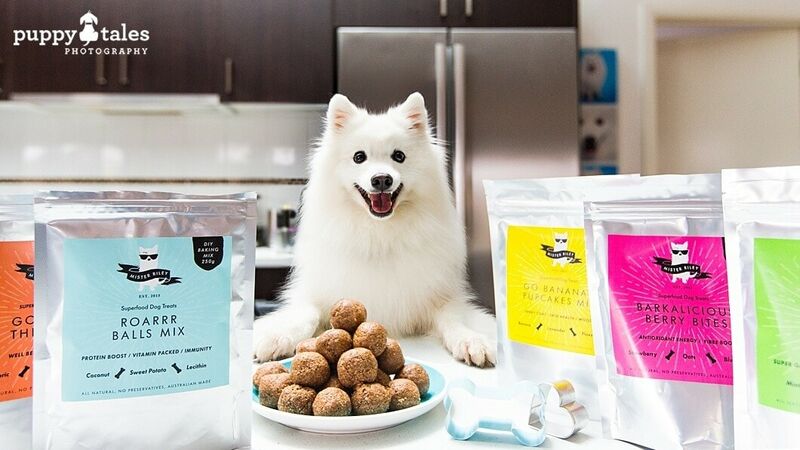 SavourLife makes a whole bunch of great treat options for dogs. The Kangaroo Training Treats are our go to for treats when we’re doing training with them. They are always close by for photography sessions, to reward good effort here. 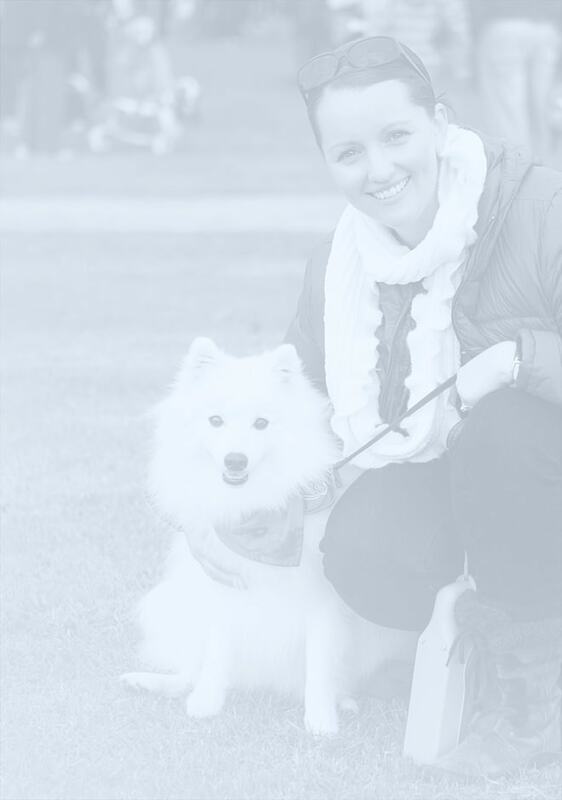 We especially love with the SavourLife products that they donate 50% of profits to dog rescues – that makes them a great treat for your dog that gives back wonderfully. I’m not much of a wiz in the kitchen (and that’s understating it! ), but these kits made baking treats for the dogs so simple. I loved that I was making something for my furkids ~ my first Martha Stewart moment ~ and that resulting biccies and treats contained lots of ingredients that were beneficial for them. The minute we pull the green tripe from the cupboard to mix in with their dinner, both dogs go insane! They know the crinkle of the packaging and can’t contain their enthusiasm. Green tripe is a source of natural probotics, vitamins and minerals so by including it in their food it adds both extra yum and health benefits for them. * Green tripe may not be a product you’ll find appetising yourself when giving it to your pups – it’s an unappealing grey-brown-green colour and has a distinct odor too! But don’t let that put you off – the dogs LOVE it and the benefits it contains make it super beneficial for them. Next pop on over to gift ideas and inspiration for the Lux Pup!